I have never heard of the Shooting, Hunting, and Outdoor Trade Show, but I think it is just hysterical that it abbreviates to SHOT. It sounds like a fictional group in some anti-gun propaganda film. 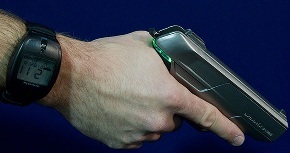 Anyway, during SHOT, a German company known as Armatix had a smartgun like I have never seen before. This pistol is programmed not to fire unless you get a wireless arming signal from a special wristwatch. As you can see from the photo, there is a green light. It means you can fire the gun. A red light means you can’t fire it. I’m not certain if the red warning light should mean that the gun will fire, so don’t mix up the light colors. The lights on the gun remind me of the phasers in the last Star Trek film. Speaking of films, the Armatix really should be in a movie. Here’s the scene: some hero is trapped in a room with a bad guy who has an Armatix pistol. The bad guy is about to shoot him, and then the hero manages a precision knife throw that cuts off the wristwatch. The villain can’t shoot his gun without the watch. Then the hero and the villain fight, and at some point, the hero gets the Armatix wristwatch in one hand, and the gun in the other. Then bang, final resolution, and credits. Armatix wants to put a limited version of the high-tech pistol for about $9,700. That’s a pretty high price, but it is the gun of the future, today! And when your watch battery dies, so do you! it will make people less carefull with guns which will be more of a problem. why would you want a gun any way..
main concept of the gun is worth giving props to. but it needs a whole lot of trial and era. plus “food for thought” why buy a gun that might jam or be hacked (electronicly) when you can buy a regular gun and pop off at any time. seems somewhat scary for a self defense weapon in a crisis situation. we like this pistol very well and we would like to get the Armatix company website, could you help us ?